​Cabbage is the crop most often affected by black rot, however, other crucifers such as broccoli, cauliflower, mustard, kohlrabi or Brussels sprouts may be affected. The first symptom one is likely to notice is a ‘V’ shaped lesion on the margin of the leaf (Figure 1). 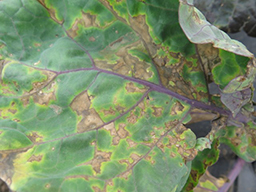 However, the symptom on Brussels sprouts observed recently are irregular, jagged lesions on leaves (Figure 2). The plants represented in Figures 1 and 2 are different varieties of Brussels sprouts. The differences may be due to differences in susceptibility of the two cultivars or the cultivar in Figure 2 may have been infected at an earlier age than the one in Figure 1. 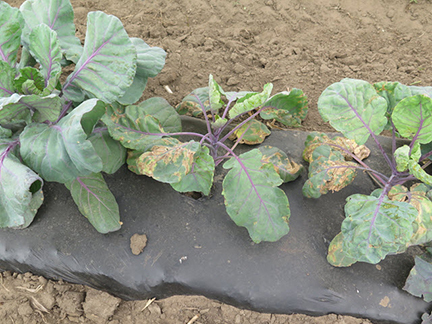 Figure 3 shows two severely affected plants next to a relatively healthy plant. Black rot is most severe in wet, warm weather. 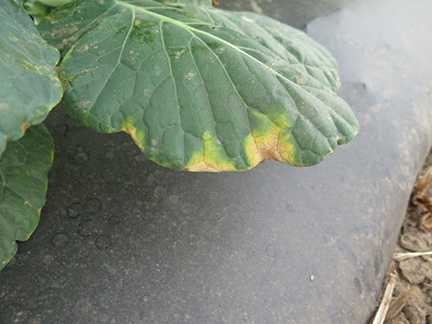 The emergence of this disease during a rather cold spring may mean that the disease started in a greenhouse situation. Figure 1. Typical symptoms of black rot include ‘V’ shaped lesions on the margins of leaf. Figure 2. Angular lesions on Brussels sprouts. Figure 3. Black rot on Brussels sprouts.